The Pan-Africa Youth Leadership Program, Meridian International Center’s newest youth leadership initiative sponsored by the U.S. Department of State, is already proving to be a success. The 24 participants, who range in age from 15-18 and represent eight different African nations, arrived in the U.S. on Sunday, April 6th. Over the next couple days, the participants were then given the best D.C. had to offer: a tour of the Capitol Building; a meeting with the staff of Senator Jeff Flake; a briefing and visit to the National Museum of African Art with the director, Dr. Johnnetta B. Cole; an excursion to the Newseum; and a bus tour of the Washington, DC area to highlight the history and sites of our capital. The participants also got a head start on building their leadership and project planning skills through facilitated workshops as they delve into addressing community challenges. Before the participants’ departure to Muncie, Indiana for the second part of their program, Meridian hosted a reception to celebrate the inaugural program. The reception gave the twenty-eight participants the opportunity not only to mingle with one another, but also to meet diplomats from their home countries and representatives from Meridian and the Department of State. 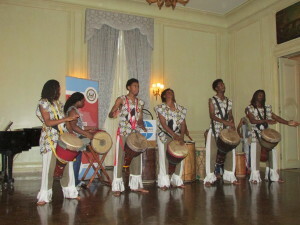 The program was concluded with remarks from Sal Pappalardo, Meridian’s Executive Vice President and COO; Rene Hajigeorgalis, Division Chief of Youth Programs at the Department of State; participant Emma Theofelus of Namibia; and a performance by the African performing group Farafina Kan. When questioned about their overall impressions of the U.S. thus far, all participants had only positive opinions—besides the somewhat atypical snowfall they encountered on their first day. Many were impressed by the sites seen on their tour of the city, by the Capitol Building, and by the program itself. The second aspect of PAYLP includes a two-week stay in Muncie, Indiana, where the students will attend classes on Social Entrepreneurship at Ball State University. The goal of PAYLP is to encourage students to use the lessons learned from these classes to cultivate projects of their own that will make an impact on their communities back in Africa. At the end of the program, during a short stay in Chicago, IL, the students will present pitches for their social entrepreneurship projects. After being judged, three participants will receive funding to help them implement these projects and effect positive social change. 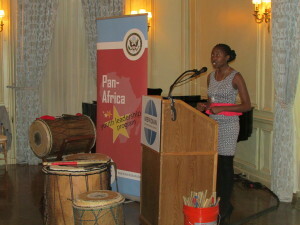 The enthusiasm for this feature of the program was palpable even during the reception at Meridian International Center. Already excited about meeting representatives from the Malawian, Kenyan, Namibian, South African, Zambian, and Botswana embassies, participants were eager to discuss their entrepreneurial ideas not only with these representatives, but also with other reception guests such as Atlas Corps Fellows, Meridian staff, former program Alumni and representatives from the Department of State. Their enthusiasm for their projects was matched by their excitement to meet their host families in Muncie. These families will supplement the participants’ stay by providing a stable home environment that also gives them a chance to experience American culture in a very hands-on way. The PAYLP journey has only begun, but the program already shows immense promise. 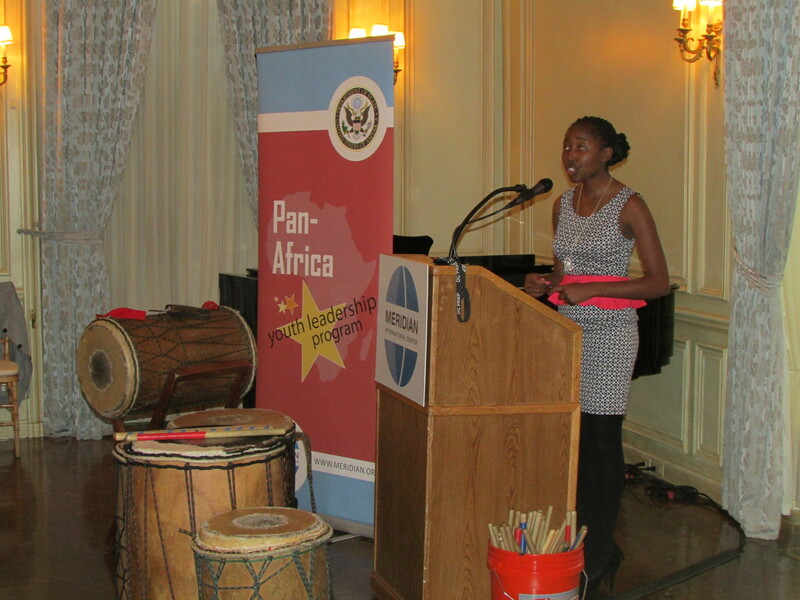 During her speech at the reception, participant Emma Theofelus eloquently summed up the merits of the program: “There is a common saying in Africa that the youth of Africa are the leaders of tomorrow. But sometimes we see that most of our leaders don’t understand that we can never be the leaders of tomorrow if we don’t get the training today”. Inspiring young leaders to take action is one of Meridian’s core values, and there is no doubt that the participants from PAYLP will indeed be Africa’s leaders of tomorrow. POST TAGS: Africa, Exchange, PAYLP, Volunteerism, Youth.